National Bank of Greece Building (former Stock Exchange), Athens, used as the main venue for the Athens Biennial 4 – Agora, 2013. 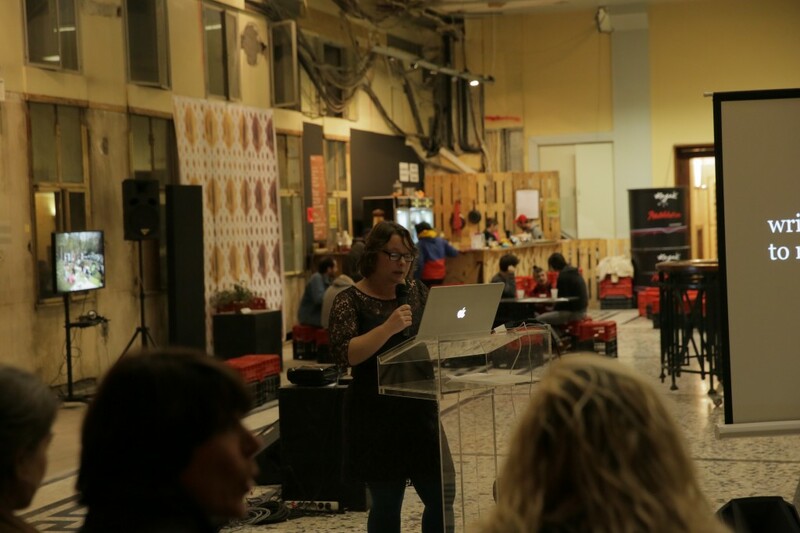 ‘Producers-Parasites-Hosts’ was a collaborative performative lecture with Amsterdam-based artist Annabel Howland and part of “The Non-Serious Lectures” (on economy and value) programme at the Athens Biennial – AGORA 2013. 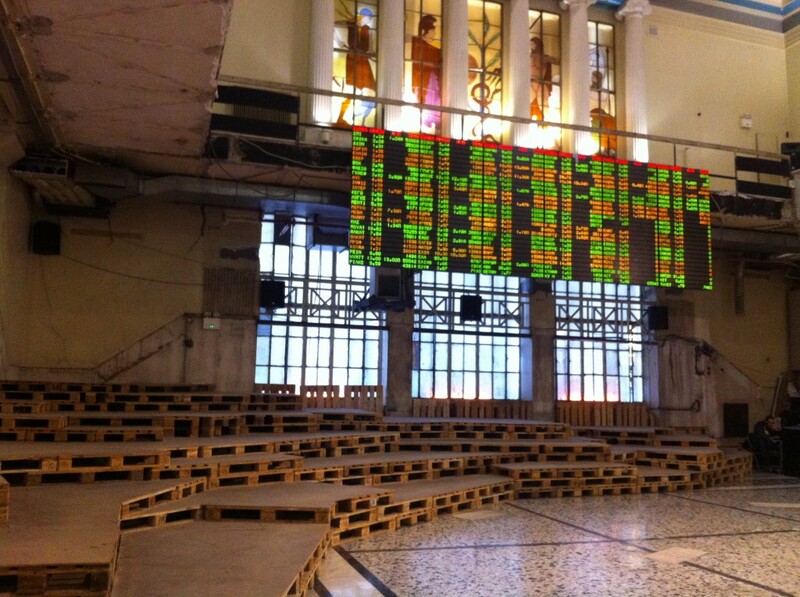 It took place on Thursday 28 November, 2013, in the disused National Bank of Greece Building (the former Stock Exchange), in Athens. Using the building of the former Athens Stock Exchange as its main venue, AB4 proposed AGORA not only as a place of exchange and interaction, but also as an ideal setting for critique. The main focus of this programme was to highlight and discuss the shortcomings of the economy. Howland’s artistic research into the world of finance and mutually beneficial relationships in biology stimulated me to develop a lecture that looks into Jorn’s ideas on the position of the artist in society. 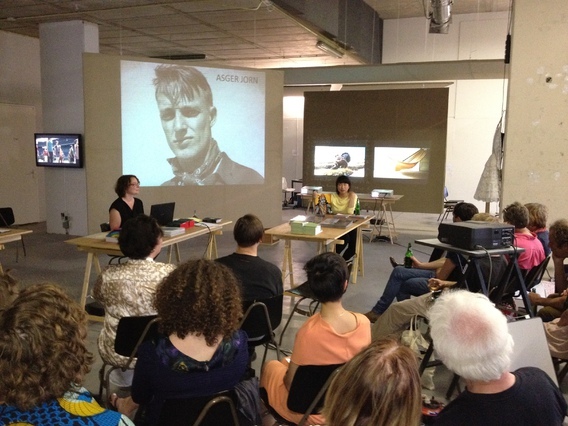 The lecture is to a large extent based on Jorn’s publication ‘Value and Economy – A Critique of Political Economy and The Exploitation of the Unique’, but is also indebted to Graham Birtwistle’s insightful publication ‘Living Art – Asger Jorn’s comprehensive theory of art between Helhesten and Cobra (1946-1949)’. 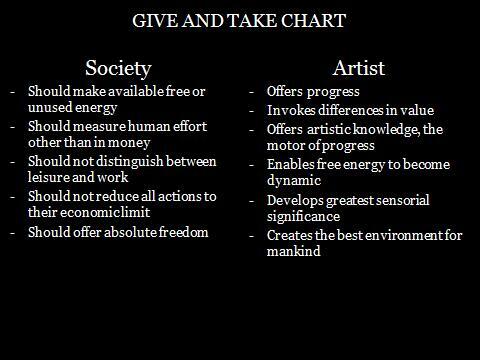 For the lecture in Athens I compiled a somewhat ironic give-and-take chart, between artist and society. When Jorn provides ‘arguments’ that cannot be quantified, or balanced out on a chart, I discard them and proceed with explaining his notion of a ‘living art’. 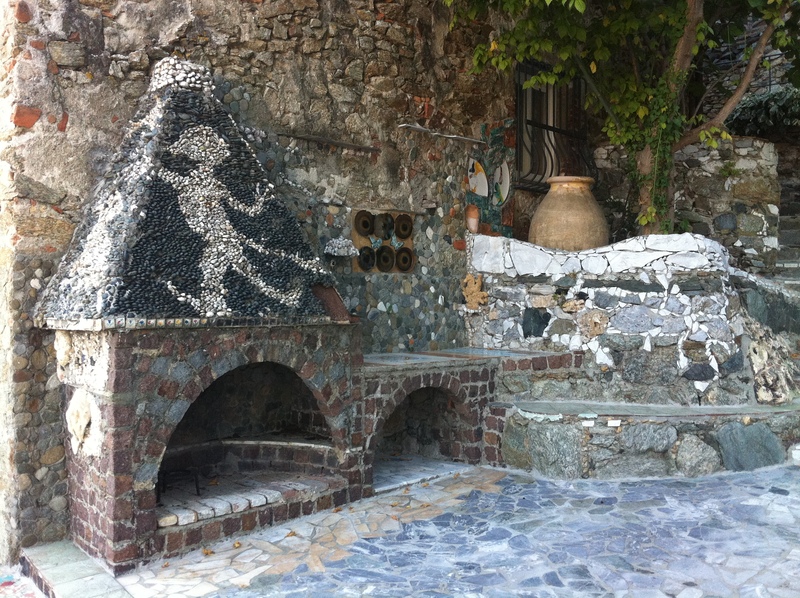 Here is a link to a sound recording http://www.annabelhowland.nl/blog/athens-mix/. In the framework of my research into Asger Jorn´s writing and thinking I organize public sessions with special guests. The guest´s practice, knowledge, insights, or responses are informative to my research, or steer the direction that I take on a particular topic. Oftentimes, the sessions also responded to the context of the hosting institution, or to a specific request. Making the sessions public is a way to share and dialogue with audiences. Below is an overview of the the sessions that took place so far. I also post more detailed reports. 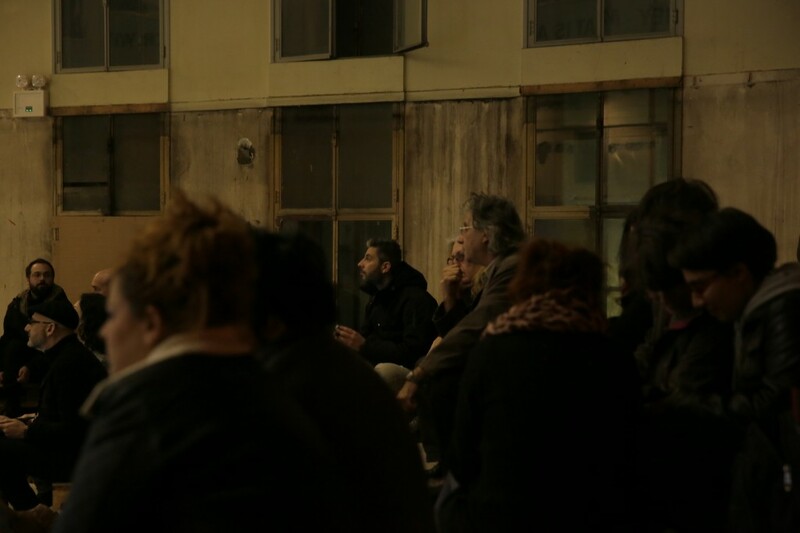 A collaborative performative lecture with Amsterdam-based artist Annabel Howland as part of “The Non-Serious Lectures” (on economy and value) programme of the Athens Biennial – AGORA, 2013. The lecture took place Thursday 28 November 2013, at the deserted National Bank of Greece Building (former Stock Exchange), in Athens. A talk and interview with Silkeborg-based researcher, critic and teacher Ruth Baumeister at Upstream Gallery, Amsterdam. This session took place Saturday 22 February 2014. Rob Voerman’s architectural installation ‘The Fifth Season’ conceptually and physically framed the event. A talk by Berlin-based artist Shannon Bool and myself in the framework of the exhibition ‘Shana Moulton – episodes from Whispering Pines’ at Nieuwe Vide, Haarlem, NL. The talks took place on 16 March 2014, coinciding with ‘de Haarlemse Lente’. A talk by Ferdinand Ahm Krag and myself in the framework of the exhibition ‘Asger Jorn – Restless Rebel’ at the Statens Museum for Kunst / National Gallery, Copenhagen. The talks took place Saturday 22 March 2014. ‘Comparative Vandalism’ was an exchange of thoughts on Asger Jorn’s Scandinavian Institute of Comparative Vandalism hosted by Officin Books, Paper and Prints Copenhagen. With Niels Henriksen, Ellef Prestsæter and Nicolas Malevé as special guests and with Søren Andreasen, Helle Brøns, Louise Hold Sidenius, Marie Kølbæk Iversen, Jørgen Michaelsen, and Teresa Østergaard Pedersen. The session took place Sunday 6 July, 2014. A lecture by me, discussing the work of Klara Lidén (1979) through the lens of Asger Jorn’s ideas on vandalism. The lecture took place on January 6, 2016. A session with Athens-based artists Kostis Velonis and Yiannis Isidorou hosted by Circuits and Currents, the Project Space of the Athens School of Fine Art. The session took place on January 8, 2016. In his writing and thinking Asger Jorn discusses and interconnects a variety of issues and fields. The lecture ‘Asger Jorn – Thinking in Threes’ is the more or less natural consequence of me trying to find a way to deal with these complexities. It introduces Jorn’s practice in an inclusive way, discussing his art, groups that he was associated with, his publishing and thinking.